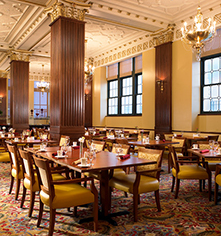 Situated in the vibrant Power and Light district of Kansas City, the Hilton President offers a variety of dining options designed with every guest in mind. Guests can start the day with a hearty breakfast, savor innovative dishes prepared with only the freshest ingredients, or simply relax with a cup of coffee in the hotel lounge. 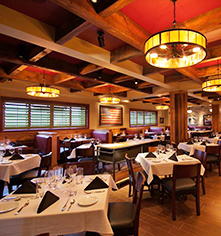 Providence - Reminiscent of a Midwestern supper club, this refined restaurant serves classic American cuisine utilizing locally sourced ingredients. 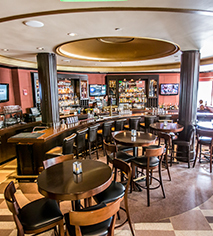 Drum Room Lounge - An iconic setting, this historic entertainment lounge serves lunch and dinner in a casual, nightclub atmosphere. Walnut Room - Boasting gorgeous rich wood columns, this elegant restaurant is open for breakfast and the ideal setting for important business or private events. In-Room Dining - Guests can order and enjoy all the delicious dining options of the hotel from the comfort of their room.